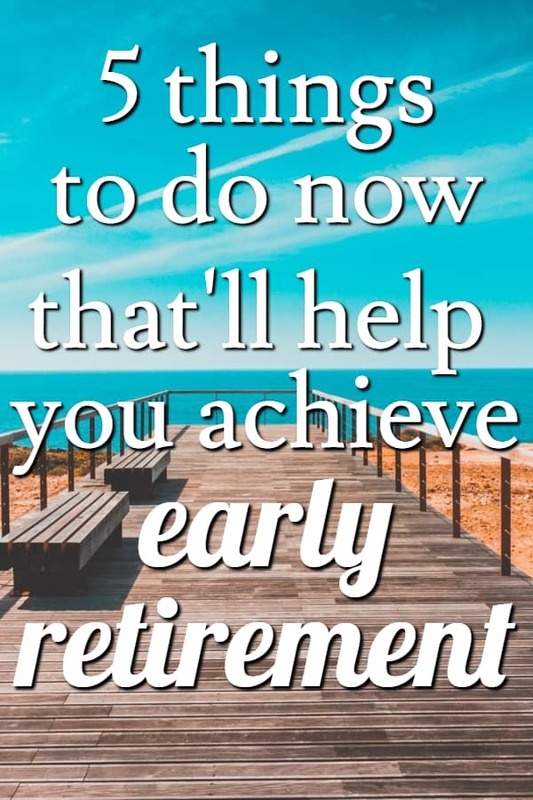 Early retirement is the dream for many people, myself included. However, it doesn’t have to be just a dream. There is a whole movement of young people who are actively pursuing early retirement. Exactly what this looks like is different for everyone. Some people set their retirement goal at age 40, and plan to live somewhere like Thailand where the cost of living is low, so they only need 30k/year to live well. Other people might plan to live in the United States, and thus, need more money so they set their early retirement goal to age 50. Regardless of what your goal is, the fact of the matter is, if you’re not a fan of the idea of working for a boss until you’re in your late 60’s and then living frugally on social security benefits, then you need to start taking steps to make sure that early retirement isn’t just a pipe dream. And when it comes to planning for early retirement, there are some small money moves that can have a big impact on your finances. Below are 5 simple steps you can take right now that’ll help you reach your dream of early retirement. I’m a big fan of vision boards. I’ve been making them since I was a teenager. When I think back to some of my early vision boards, they would have things like a picture of the latest Nike sneakers and a photo of AJ from the Backstreet Boys haha! While I never ended up marrying AJ, I did just buy a new pair of Nike sneakers, so I guess my vision board half worked, right? But in all seriousness, visualizing what you want out of life CAN help you achieve it. A study published in Psychologia showed that mentally practicing something can be almost as effective as physically practicing something, which just goes to show the power of the human mind. However, if you think that you can simply create a vision board and then sit back and wait for the universe to provide everything, that’s not quite how it works. Vision boards can be an incredible tool to help you visualize what you want and motivate you towards achieving your goals, but like all things life, you still have to take action. If you don’t have a side hustle yet, what are you waiting for? These days there are so many side hustles you can start to make extra money, that there’s really no excuse for you to not be making a bit of extra cash that you can save or invest for your early retirement. Of course you can go the traditional route and start delivering pizzas or get a job as a server, but really, if that’s not your cup of tea, I’d recommend starting an online side hustle. It’s pretty sweet to be able to sit on the couch in your sweatpants and make money on your laptop. Blogging – this is my favorite side hustle. I own two profitable blogs, and I’m able to work on them from anywhere in the world, whenever I want. It sounds cheesy and I almost don’t even want to say it, but blogging really has changed my life. I make more money blogging than I ever did working for an employer, and it’s making a HUGE impact on our early retirement plans. In fact, I’d even go as far as to say that our plans to retire at age 40 wouldn’t have even been possible if it weren’t for the income I make from blogging. You can get started blogging for as low as $3.95/month. This makes blogging the perfect low-investment side hustle, with the potential for big returns. You’re probably spending $3.95 or more everyday on a drive-through latte, so I’d encourage you to forgo the latte one day per month to start your own blog. Online surveys are another good way to make some extra cash. The earning potential definitely isn’t as high as blogging, but the difference is that you’ll start earning money a lot sooner and the amount of work required is much less. When I was younger, I used to LOVE buying new clothes. And let’s be honest here, nothing has changed. I still love buying new clothes. The difference between then and now? I pause before I purchase. Mindless spending is one of the biggest culprits when it comes to people getting into credit card debt. We live in a consumerist society, and it’s become so easy to buy whatever we want. It’s as simple as swiping your credit card or entering your Paypal password online. Is this going to make my life better? Am I only buying this to keep up with Joneses? If you want to take it a step further, wait a couple of days and see if you’re still thinking about whatever it was you wanted. If you’ve forgotten about it already, you obviously didn’t really need/want it. Implementing this step alone can go a long way towards reducing your spending and thus increasing your chances of early retirement. If your savings are currently sitting there in a low (or no) interest savings account, did you know that you’re actually losing money due to inflation? Instead of losing money by squirreling it away in a savings account (or worse still, under your mattress) I recommend you start an investment account. Investing can sound scary if you’re new to the idea, but it doesn’t have to be. I started investing with Betterment, which is a robo-advisor that essentially does all of the work for you. It’s very hands off and perfect for someone who wants to invest their money but doesn’t have the time, knowledge and/or desire to handle their own portfolio. Having said that, it is a good idea to at least familiarize yourself with some must-know common investment terms you’ll come across. I come from a long line of bargain hunters, so I know a good deal when I see one. I almost never pay full price for anything, and I’m always looking for ways to get cash back on my purchases. For online shopping, I highly recommend joining Ebates. It’s free to join and you’ll earn a percentage of cash back on your purchases. Ebates has partnered with thousands of retailers so you’re almost guaranteed to find some of your favorite stores that are offering cash back. Join here and get a free $10 gift card. Did you know you can also get cash back on your groceries? We all buy groceries, so it’s a no-brainer to join Ibotta and start earning cash back. Ibotta offers cash back on hundreds of grocery store items, including healthy stuff like fruit and vegetables (which are notoriously difficult to find coupons for!) Join Ibotta here and get a bonus $10.